After cooking this pork roast recipe I was tempted to call my family and friends and apologize for all the dried out pork I'd served them over the years. OF course, they never complain since they're never the ones cooking (they're very smart), it's usually me. In any event, if you've ever tasted meat so tender and juicy that you just closed your eye's and savored the flavor, then why not recreate that moment with this exceptionally tender and juicy apple brined, maple glazed pork roast? 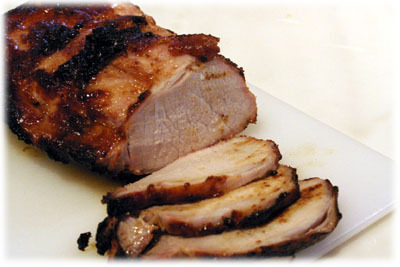 The "secret", if you want to call it that, to this juicy, flavorful pork recipe is to use one of the more interesting brine recipes I've found. 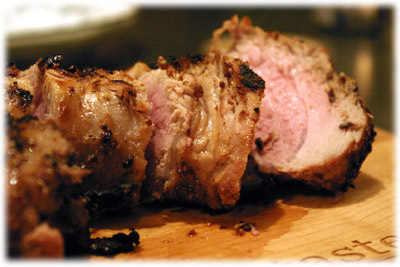 The pork roast soaks in an apple-peppercorn-onion flavored salt brine overnight and the flavors simply infuse the meat. 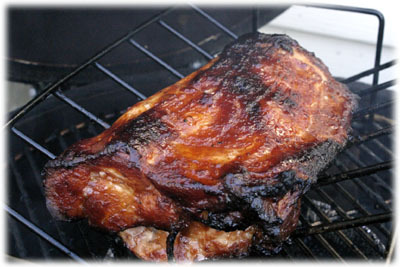 Once you try brining it this you may never prepare BBQ pork any other way. The finishing touches to this juicy pork roast recipe has to be the Maple-Mustard glaze. 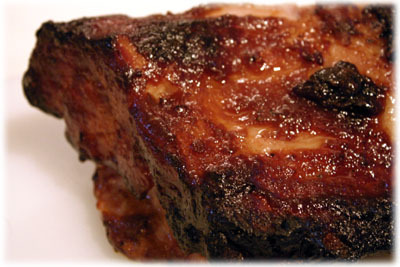 Spread it on as the pork roast cooks and it carmelizes into a sweet and sticky crust that is to die for. 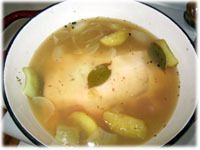 Combine all of the brine recipe ingredients in a large pot and bring to a boil. Allow to cool to room temperature before placing the pork roast in the brine. Make sure the roast is completely covered in the liquid. Cover and refrigerate overnight if possible. 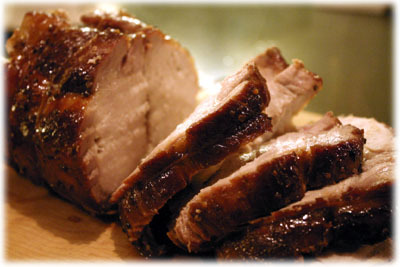 Combine the remaining 8 ingredients of the Maple Mustard pork roast glaze to the saucepan with the pureed onion/garlic and stir well to combine. Preheat the BBQ or Grill to 250F and set up for Indirect cooking. Place an aluminum pan filled with apple juice or apple cider directly under the cooking grate where the pork roast will be. 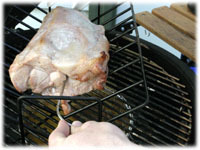 When the grill reaches cooking temperature place the pork roast on a roasting rack on the grate (or place the roast directly on the grate) over the pan of liquid. Insert a temperature probe into the center of the roast. 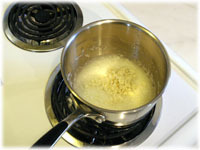 Close the lid and let cook about 1/2 an hour. 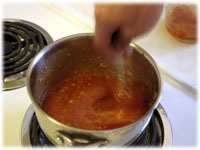 Every 1/2 hour lift the lid and baste the roast with some of the Maple Mustard Glazing sauce. Once the internal temperature of the roast reaches 150F it's time to remove it from the grill. Cover with foil, poke a small hole in the top of the foil to let steam escape and let sit 5 minutes before carving. Note: Pork roast recipe cooking time is based on internal temperature as different sized roasts take different amounts of tine to cook. 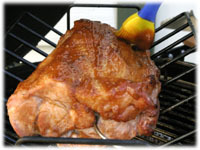 It's now USDA accepted that internal temperature of a Pork roast recipe is no less then 145F.